Don’t confuse simple with simpleminded—our Roll Comp X1 Low Entry might take offence. That’s because we designed it to be the hassle-free, no-fuss, no-excuses bike to help you hit your fitness goals. 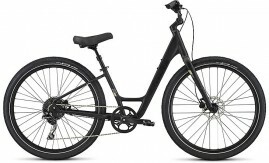 It’s a tall order, sure, but with its one-by gearing and low entry, you’ll never have to worry about weird, cumbersome gearing, struggling to get on or off the bike, or putting a foot down at a stoplight. Pretty cool, right? Of course, there are more tricks up the Roll’s sleeve, like hydraulic disc brakes that stop on a dime in any condition, a relaxed, upright geometry that strikes the pinnacle of comfort, and wide tires that give you all the grip and stability you need to get it done.